Roberts R-Line S1 review | What Hi-Fi? No matter how many radio brands come along with designer labels and funky multicoloured designs, Roberts will always have one thing on its side: a rich heritage built on trust and, as holder of two Royal Warrants, tradition. The British company has far exceeded its humble beginnings over 80 years ago as a purveyor of radios with only a handful of employees and a single-figure weekly production yield. Its radio products have seeped into the wireless speaker market with much success; the Revival iStream 2 and Award-winning Stream 93i bagged rave five-star reviews from us. So maybe casting its sights even further afield to multi-room isn’t so much of an ambitious gamble as a natural stepping-stone on the path of modern home audio. 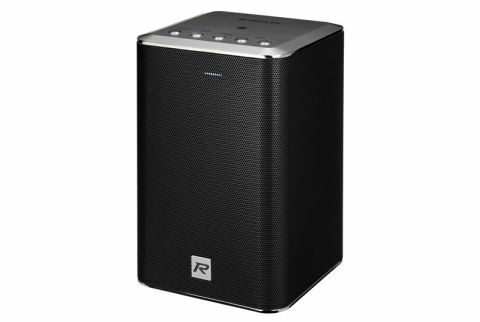 Roberts’ multi-room R-Line comprises six wireless speakers, separated into three ranges: the R-Series, S-Series and a single soundbar ­(the company's first). While the R-Series speakers, with their tan leather strap and (optional) portable battery pack, look suitable for an afternoon picnic in the park, the two-strong S-Series is more like your standard, mains-powered Sonos rival. Here we have the entry-level model within it, the R-Line S1. It has become customary for us to compare any multi-room product we receive against a Sonos one, which is unfortunate for the competition. While the multi-room mogul is undoubtedly an inspiration for many entering the market, Roberts doesn’t appear to have hidden that at all. At least, when it comes to looks. With a curved tubular design and grille wrapping hiding its two tweeters and single woofer, the S1 looks very similar to the Play:1 (£159). Despite the cheap plastic feel of the top panel and the few buttons that sit atop it, Roberts has dressed the S1 in its Sunday best; the silver finish is immaculate, and it's nicely decorated with silver accents that give it some of the retro styling that’s defined Roberts’ products for decades. But the features list is even more impressive. You can combine two S1s to create a stereo pair (a switch on the back lets you allocate one unit to the left channel and one to the right). Once hooked up to your local network, via wi-fi or Ethernet, the S1 can stream music from your PC, NAS drive or Spotify streaming service, and play thousands of internet radio channels. Erratic internet connection? Off-air music playback is also possible via Bluetooth (there’s NFC for one-touch pairing) and a 3.5mm input on the S1’s rear. That’s one over on Sonos, certainly. Roberts is on a level playing field with Sonos when it comes to file compatibility too, choosing not to fly the hi-res audio flag, and instead tapping out at CD-quality. But it fails to snap at the heels of its competitor’s vast streaming service support, which alongside Spotify includes Tidal, Amazon Music and Google Play Music. Invariably, Roberts will need to build its repertoire to be in the running as the next multi-room marvel. We can only hope that’s doable, as instead of investing in its own proprietary app, Roberts has opted to run with Undok, a universal app that's used by the likes of Ruark Audio and Revo. Undok is free for Android and iOS devices, and not only compatible with the R-Line range but older models like the Stream 93i too. We’re pleased to report that Undok works very smoothly with the S1. The interface couldn’t be simpler, with most functions under three self-explanatory tabs: Source, Now Playing and Browse. It doesn’t loiter loading our various music libraries, and there’s very little hesitation when it comes to pairing and ungrouping speakers. All in all, it’s a painless experience – as it should be. There’s a switch on the back of the speaker to change the presentation between normal and wide. But even with the latter activated, there’s less to be emphatic about in the sound department. Yes, the S1’s undoing is nigh. It throws out sound much further than its proportions suggest, and for that reason doesn’t have to be consigned to small rooms. Reasonable detail spreads through a soundstage that’s balanced, crisp and snappy from top to bottom. A vocal talent, it seizes the rough and readiness of Nina Simone’s throaty vocal in I Wish I Knew How It Would Feel to Be Free, projecting it with confidence and largely getting across the dynamic emphasis she places on certain lyrics. But that’s somewhat let down by a hardness that tarnishes the upper midrange, and that doesn’t settle down even after a weekend’s run in. And while the soundstage is notably spacious, poor timing and organisation within in gets the S1 a little hot under the collar when fed dense material: the labyrinthine electronics in Front Line Assembly’s Deadened, say. The Sonos Play:1 is easily the more engaging listen, carrying the track’s trippy dubstep rhythms with greater confidence, clarity and energy, and offering more insight into the layered synths. Roberts has successfully strayed from its stomping ground before, but this time the venture isn't quite such a hit. While looks and user experience can’t be faulted, features and sound quality need to be better than ‘okay’ before we can wholeheartedly recommend it take up shelf space in a room, let alone several.